In case you missed it last week, here is my project for Wood you like to Craft? this month. Crafty Sisters is hosting so be sure to head on over and check it out and link up to the party. There will be a prize! Hey everyone! This is Krystal, the crazy lady behind Sassy Sanctuary. I'm so excited to be here today! 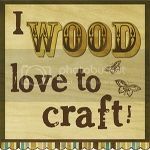 I hope you all are having a blast with Wood you like to craft? I'm lovin it! (ba da ba ba ba) It is so much fun to create something each month and to stretch myself. Everything that I have made is something that I probably wouldn't have done without the push, but I LOVE them. Some of my favorite projects yet. I sure hope you'll join in on the fun! Anyway, I was super excited when Candace and Nicole announced the project for this month. So many directions it can go! I love their tool box to bits and knew I couldn't compete, so I went a little different with it and made a planter box. Its super simply constructed. Just a box made from 1/2" wood. I gave it a little more style though by angling the sides (15 degree angles), adding rope handles, and a decorative medallion to the front. Of course the finish totally makes it. Did you know that you can go to Home Depot, and for $3 get an 8oz sample made up in any color? And you can get it in a paint and primer in one. Who knew?!? The color is "teal zeal" from Behr. I just painted it, beat the crap out of it with my sander and a fork. (yes, you read that correctly, a fork) and then did a top coat of wood stain. To keep it looking beautiful forever I also did a coat of wipe-on poly once it had dried... but that's optional. The rope handles are my favorite part. But the best thing about a piece like this, is it is so versatile. It looks great on the front step. I love it on my kitchen table. But its final home will be as part of my sofa table display. So that's it. I'm totally loving my planter box, now go make one too! How to add a picture marquee to your blog.